So, I got bored the other day and sat down again for a little while with “Fender Amps: The First Fifty Years” by John Teagle & John Sprung. If you haven’t read it yet, do yourself a favor and pick up a copy. It is loaded with tons of great historical info about every vintage Fender amp you can imagine. While reading some of the history of Fender in the 50s I noticed that throughout their narrative, they refer to the amount of square footage of manufacturing space the Fender Electric Instrument Co. had in operation at a given period of time. They begin with telling us that in 1946 Leo Fender “had a pair of unheated, un-air-conditioned sheet-metal buildings…” with about 3,600 square feet of floor space. Right after CBS acquired the company, they consolidated 17 (and maybe as many as 27) separate buildings with about 100,000 square feet of space into one monster facility with 175,000 square feet of manufacturing space with an additional 55,000 square feet of office space. This is equal to 5 acres all under one giant roof! So, I decided to graph it for fun, because EVERYONE loves a graph. Check out my awesome Excel skills after the jump. I only included manufacturing space in the graph, but if you factor in the office space too, that is a whopping 230,000 square feet of space! It is easy to take for granted these days that Fender has always been a huge company. That wasn’t always the case and in the late 70s it was doubtful the company would even survive. When looking back on this sweet period of history, when Fender was an innovation machine cranking out great products (like the immortal Champ!) and creating entire markets that hadn’t really existed before, you can actually SEE when that influence exploded onto the world. The growth in manufacturing capability, particularly when looking at the late 50s and early 60s, is astonishing. It is also easy to visualize how this explosive growth lead to the stress and health issues Leo faced prior to the sale to CBS. The Fender Electric Instruments Co. was a MONSTER organization by the time of its sale to CBS. As an interesting aside, Teagle & Sprung note that Leo’s philosophy of building manufacturing facilities tended to focus on smaller, individual buildings. This was in case they had to be sold off if things didn’t go according to plan. Are you all impressed? Let me know in the comments. I sure was (my wife…not so much). I’d also be interested to hear if anyone else has come across information like this? My graph is a little choppy and could stand a few extra data points, although it makes sense that manufacturing space increases wouldn’t show a nice smooth uptrend, but reflect large chunks of space becoming operational upon completion of construction. 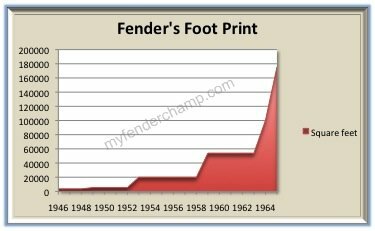 Don Randall once told me that Fender Sales had revenues in excess of $20M in 1964 and that the factory’s output increased by 80% in 1965. After the Beatles appeared on Ed Sullivan, everyone wanted to play guitar. The exponential growth was a contributing factor in Leo wanting to sell the business. It was far more complex and onerous to run the factory in 1964 than it was 10 years earlier. It also interesting to note than during the expansion Leo built additional smaller separate buildings on to the factory, rather than one large building as CBS did. His thought process was he could rent out the additional buildings if there was ever a downturn. The original 9 buildings on South Raymond in Fullerton are still there and in use. The CBS factory was torn down last year. Adjusted for inflation, $20 million in revenue in 1964 is equal to about $140 million today.